Is It Better To Rent Or Buy.....it depends....really! 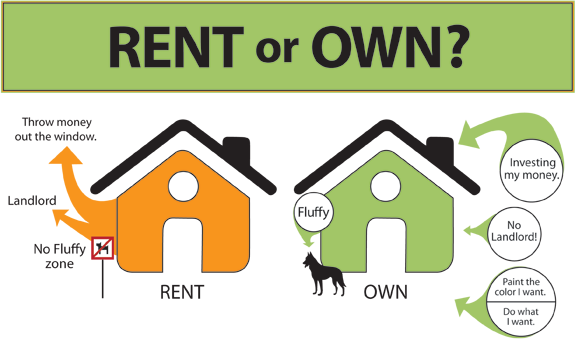 To Buy Or Rent…..that is the question! Is It Better To Rent Or Buy…..it depends….really! William Bennett and his wife, Jennifer, have a 3 year old son and a 2 year old daughter, healthy incomes and plenty of cash in the bank for a down payment on a house. But they are happily renting a townhouse in Dublin, California, with no plans to buy for now, given the frothy prices in their area. “As long as there is such a disconnect, where a couple like my wife and me have to put down a gargantuan down payment and still have a large monthly payment to get into a decent, and not necessarily nice, house, that is a game we don’t wish to play,” said Mr. Bennett, a 35-year-old IT manager at a technology company. “When home price-to-income levels come back to a more normal level, when that happens, then we will be the first to jump in. If that never happens, that is O.K.” Living in the San Francisco Bay area puts many couples like the Bennett’s in similar situations. So if a 3 bedroom apartment in Las Vegas would rent for $1,138 a month, that means you shouldn’t pay more than $205,000 ($1,138 x 180) for an equivalent property. Based on the current rental prices in the Las Vegas Valley, its better to rent a home than to own one at this time. The median home prices in Las Vegas currently is $ 275,000. Buying a home in the valley made much more sense between 2010 to 2015. It’s now become a huge sellers market and its driving prices way up! Use this “BUY OR RENT” calculator to determine which option is the best for you based on your specific situation. If you’d like to take advantage of the Las Vegas, Nevada sellers market but you don’t have the money to fix it up, you may want to consider selling your home to us because we buy AS-IS properties……..Just fill out the easy form below to get your no obligation quote within 24 hours.